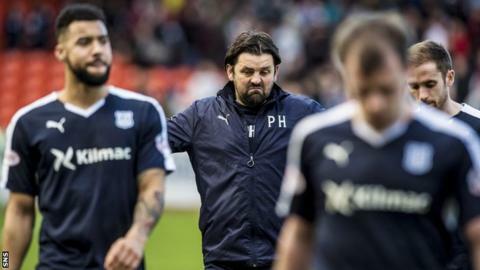 Managers Mixu Paatelainen and Paul Hartley saw the positives in their sides' enthralling 2-2 Dundee derby draw at Tannadice. United fought back from two goals down against a Dundee side reduced to 10 men following the dismissal of goalkeeper Scott Bain. "Their attitude was brilliant, they kept going and they're disappointed in there," said Dundee boss Hartley. And United's Paatelainen added: "The boys have tremendous spirit." The result moved the Tangerines to within seven points of second-bottom Kilmarnock in the Scottish Premiership. And Paatelainen's men have eight games to play, versus Kilmarnock's seven. "Delighted with the point," the Finn told BBC Scotland. "Little bit disappointed we never took the full three points. I thought it was there for us. "The second goal, we fell asleep a little bit. They punished us. "The way they fought and kept believing - thankfully we got there in the end. "You can't take anything for granted, even though we have a game in hand. We have to win that game and the rest of them. "We just keep our heads down and keep working and hopefully, hopefully come the end of the season, we're not last, at least." The drama on the pitch was greeted with exchanges on the touchline, with Paatelainen engaging with opposition fans. "Those Dundee supporters, they were giving me plenty pelters throughout the game," he explained. "When we scored, they were very quiet and I couldn't hear anything so that's why I was like, 'where are you, have you gone away?' No, no they were still there. "I gave them a little wave afterwards, that's the way it goes. Our supporters do the same to the opponents and they do the same to us. I have received that 25-30 years, so no problem at all - I quite enjoy that. Well, sometimes." Hartley too was animated at times when interacting with the opposition bench and said: "It's great stuff isn't it? "That's football, we're in the heat of the battle, in the moment but that's it. End of the game, it's forgotten about." Dundee's players surrounded referee Steven McLean after Bain had fouled Billy McKay, insisting that Kevin Holt's presence in the box meant there had not been a clear goalscoring opportunity. But McLean's decision was a red card and McKay converted the resulting penalty before heading a stoppage-time leveller to cancel out Kane Hemmings' first-half brace of strikes. "I'm looking at Kevin's position, can he get into cover quick enough? I don't know," Hartley said. "I'm not going to complain too much, it's not my style. I'm just disappointed for the players. "At 2-0, we're comfortable. Then the Bain sending off definitely changes the game and it gives them a grip. "They threw everything at us. I thought we defended brilliantly. Anything into the box we dealt with and then just that one moment [when Mckay scored]. "I'm proud of the players because I've got a terrific bunch."